On March 17th, Bochka restaurant is happy to invite you for a workshop “two in one”. 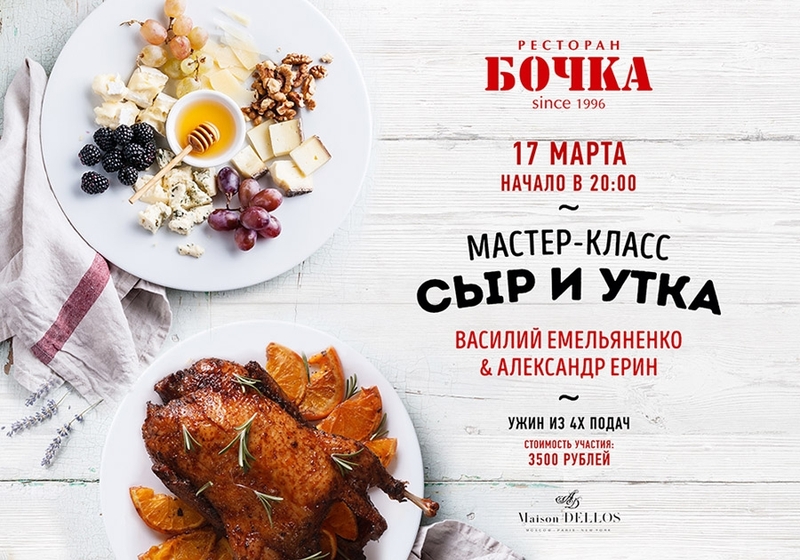 We invited two prominent representatives of contemporary Russian cuisine: Vasily Emelianenko and Alexander Erin, each of them will present his own culinary topic. The choice of speakers is no coincidence: both our guests are culinary TV show stars, so this ‘live’ duo promises to be one of the best workshops of March. Alexander Erin is responsible for the cheese part of the evening: Chef, cheesemaker, member of the Chefs Club of St. Petersburg, member of National Chefs Guild, participant in the “Real Cuisine” program. Chef Vasily Emelianenko, food producer of the show “Culinary duel” on NTV, is responsible for the duck part: he will cook duck and pear jam after his own recipe and will share some secrets of his culinary skills. Evening participation fee: 3500 rubles.